As I mentioned on my last post, we were going to take a little road trip last weekend. Long story short, what was going to be a road trip to Boise to see my brother and sister in-law, turned out to be a trip to the Oregon Coast. If you have been reading my blog awhile, you know that I love the beach. The weather at the coast was quite rainy, but we were able to get out, stroll on the beach, go shopping, hiking, during a few breaks in the weather. The best part was just getting to spend time with my family. Family bonding, if you will. 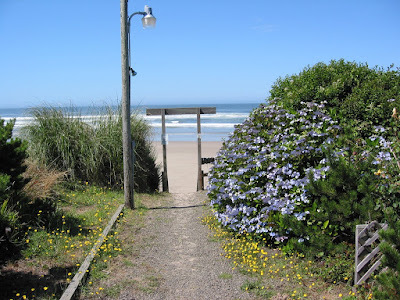 We stayed two days in a little cottage in Waldport. Very funky and vintage, with a wood burning fireplace of which we took full advantage. I even had time to read a whole book. One of my favorite authors, Adrianna Tigianni just put out a new novel called "Very Valentine." Some of you may remember The Big Stone Gap series. I loved it. Anyway, it was a wonderful read. Unfortunately,I didn't take any pictures during our trip. Camera battery died/too lazy. But, thanks to the internet, here a few shots for your viewing pleasure. Path from cottage to beach, imagine a clowdy gray sky and a lot of wet. I think I like this image better. My family was nice enough to indulge me by stopping at several antique stores/malls we happened to find. Unfortunately the getting wasn't great. I only managed to find a few items. Actually, it was a blessing as once again, I'm extremely low on funds. Here's the loot. My hubby did get one sneak attack picture before my battery died. This is my darling daughter and in the background, just above the hood on her jacket, you can just barely catch a glimpse of my adorable son. 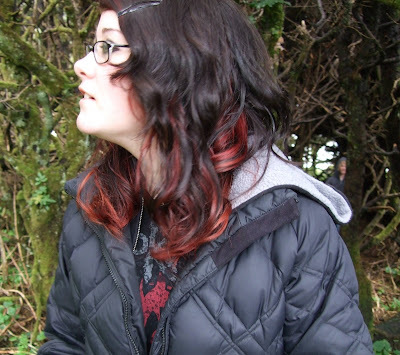 This picture was taken on our hike around Cape Perpetua. I need to get over to Monticello soon to clean up my space. 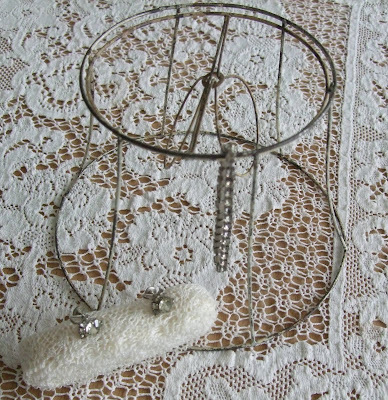 The good news is that I have sold a few items that had been there awhile. Now I have room to bring in more stuff. Hopefully if I get my act together I can head over tomorrow with a few things. Maybe hit a few sales/thrift stores along the way? The weather is suppose to be improving a bit. I hope so. Thanks to all of you who left comments on my last post about my collections. It's fun to know so many of you share many of the same collections as me. I also want to note that Mitzi is right. I did neglect to mention my most favorite collection of all. My wonderfully fabulous friends and family. All the rhinestone brooches in the world could not replace how much they mean to me. I hope you all have truly amazing weekend. 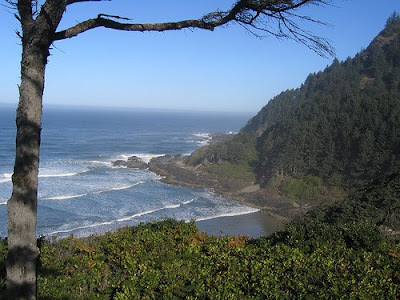 What a beautiful place to visit --- I adore the Oregon coast! Boise and the Oregon Coast are quite far apart! That was quite a little road trip! LOL! I'm glad you had a wonderful time! I just love Waldport...lived there for 2 years. It is definitely just so quaint! Sorry that it wasn't sunny for you! All so pretty. Wish I was there. Your trip sounded lovely and I adore your purchases. Last summer my husband, the kids and I rented a little house on the Oregon Coast. Every morning we would wake up to The Big Blue. It was a welcomed change during all of the Northern California wild fires. We went from Gold Beach up to Coos Bay So lovely and the beaches were clean. Thank you for the pictures. It looks beautiful! I love the sound of that vintage looking cottage. I have never been there, it certainly looks beautiful! Oregon coasting is often rainy, but those seasons are some of the best times to visit. Less people. Not that it's ever overly crowded (thankfully), but if you like more peace and quiet as we do, those times can't be beat for a visit. Our usual haunts are Tillamook and Cannon Beach. I'm glad you had a good time, regardless of the weather.